Don't make a mistake of hiring an unlicensed contractor to perform work on you home. Having work done on your home is a huge investment. It is costly, time-consuming, and should not be taken lightly. Before hiring a contractor in the state of Tennessee, follow the simple steps outlined below to ensure they are fully licensed and verified. Doing this will save you time, money, and energy. Verify that you are indeed a real person by filling in the text box as required. Type in the company name or business owner name. Make sure “contractor” is selected in the drop-down box. 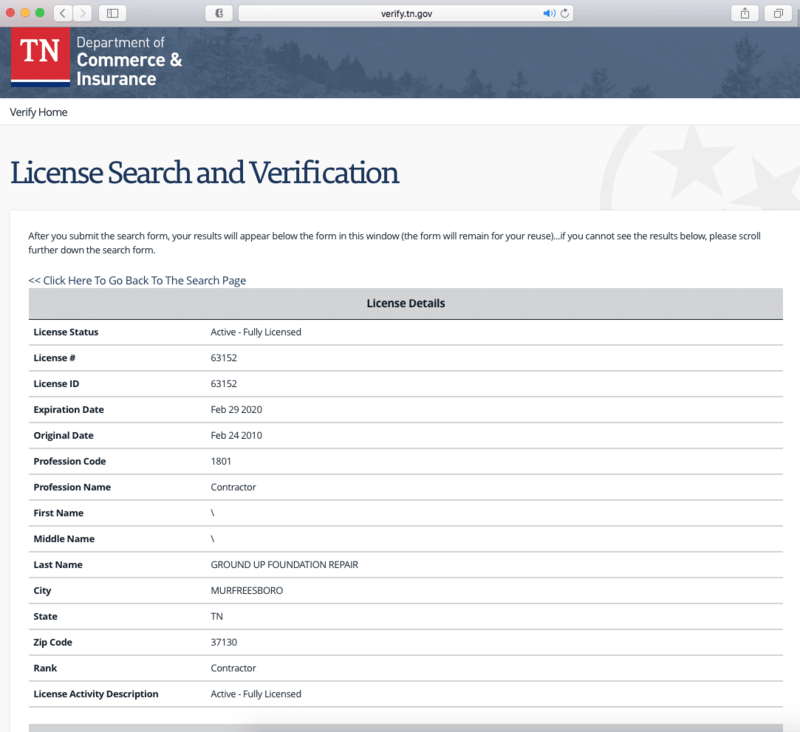 Below the information fields, you will see a list of all of the license bearing the name or business searched. Locate the correct company you are looking for. Click on the detail tab next to that company. This page shows in further detail about the company you are searching. Check the license status to make sure the license is currently active. View all of the contractor’s license details and information. This will give you an idea as to whether or not this contractor is a good investment in your home. That’s it! Following these five simple steps can help you make the right decision about who to trust with your home. Who Is Ground Up Foundation Repair? Ground Up Foundation Repair is a fully licensed and verified contractor in the state of Tennessee. We have been proudly serving businesses and homeowners in the Middle Tennessee region since 2010 – providing high-quality customer service, transparent pricing, and excellent results. Our services include foundation repair, crawl space encapsulation, waterproofing services, general contracting, and more. Contact Ground Up Foundation Repair today for a FREE Estimate. Our experts will assess the situation and provide the best solution for your property. We are a licensed and verified Tennessee Contractor. Contact us today for a free estimate. † Inspections are based on basic reviews of the property and structure for issues Ground Up Foundation Repair can assist with. Your property may require the assistance of other contractors or specialists.